Note, that this post will only show you the necessary steps for a setup – it’s by way no tutorial about how to build bundles with Spring-DM (maybe in a future post) or about OSGi at all. Unpack both archives on an arbitrary place respectively. In subsequent sections, i’ll use <Spring-DM-Root> in order to refer to the folder where you’ve unpacked Spring-DM. Start Eclipse with a new workspace. The workspace will carry all the bundles that are necessary for running your own Spring-DM based bundles (since those Spring-DM based bundles rely on some other bundles, provided by Spring-DM that we now have to import into our workspace). Those bundles that are offered by Spring-DM build the foundation for running our Spring-DM based bundles. Most important, Spring-DM provides the Extender bundle, which is responsible for detecting and managing the whole lifecycle of all Spring-DM based bundles (e.g. instantiating the Spring application contexts for those bundles). Now we have to choose the location of the bundles to import. 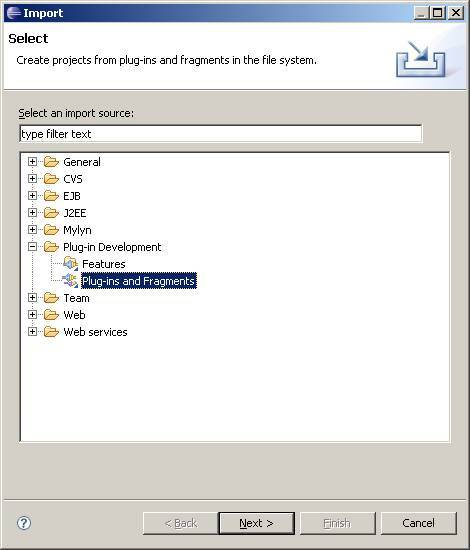 Since they come from an external source and to that effect not coming from the target platform (bundles provided by eclipse itself), we have to deselect the checkbox ‘The target platform (…)‘ and choose another ‘Plug-in location‘. 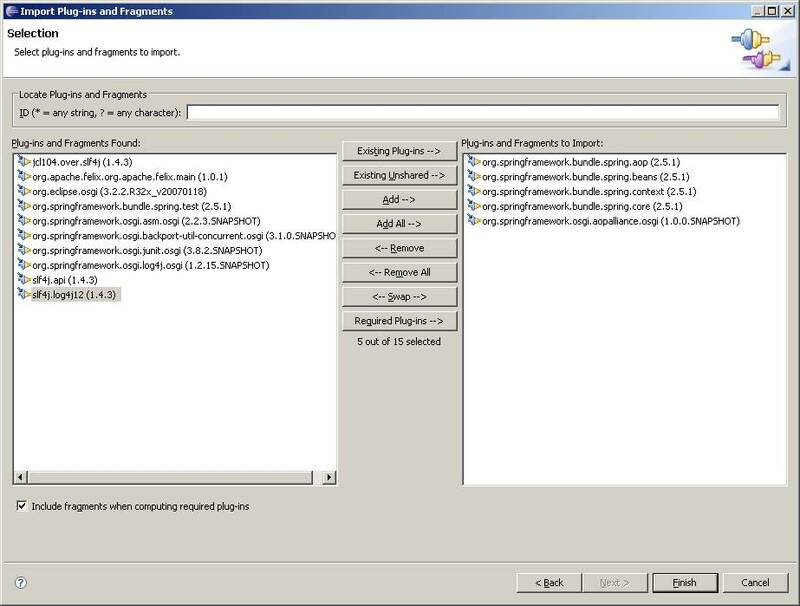 In our case, we now have to ‘browse‘ and select the folder, where Spring-DM have stored its bundles, that is <Spring-DM-Root>/dist (see image below). Since the imported Spring-DM bundles rely on some Spring bundles itself for proper functioning (the Spring framework itself is divided in a number of OSGi modules), we also have to import those bundles the same way like we did with the Spring-DM bundles. You will find them under <Spring-DM-Root>/lib. We now have imported all necessary bundles, ready to run your own Spring-DM based bundles. You should come up with a workspace that’s filled with all the imported bundles, as seen in the image below. You now could import your own bundles like we did with all those Spring-DM and Spring bundles or directly create a new bundle within Eclipse (‘File‘ -> ‘New‘ -> ‘Project…‘ -> ‘Plug-in Project‘). You now could run your bundles by starting Equinox, the underlying OSGi container. It’s best done by creating a new Start configuration for the ‘OSGi framework‘ and selecting all bundles that should be started when running the OSGi container. Open the Run Dialog (‘Run‘ -> ‘Open Run Dialog…‘ ) and create a new ‘OSGi framework‘ configuration (on the left hand via context menu). Select your own ‘application’ bundle and at least ‘org.springframework.bundle.osgi.extender‘ – the Spring-DM Extender bundle (as the case may be, all bundles are selected initially – first deselect all bundles, since we don’t want to run all bundles). Now if you click on ‘Add Required Bundles‘, all bundles that your application bundle and the Extender bundle rely on will also be selected automatically (you can check that all inter-bundle dependencies are resolved by clicking ‘Validate Bundles‘). Side note: i deselected the ‘Target Platfrom‘ bundle ‘or.apache.log4j‘ since there are some class loader issues with that bundle. 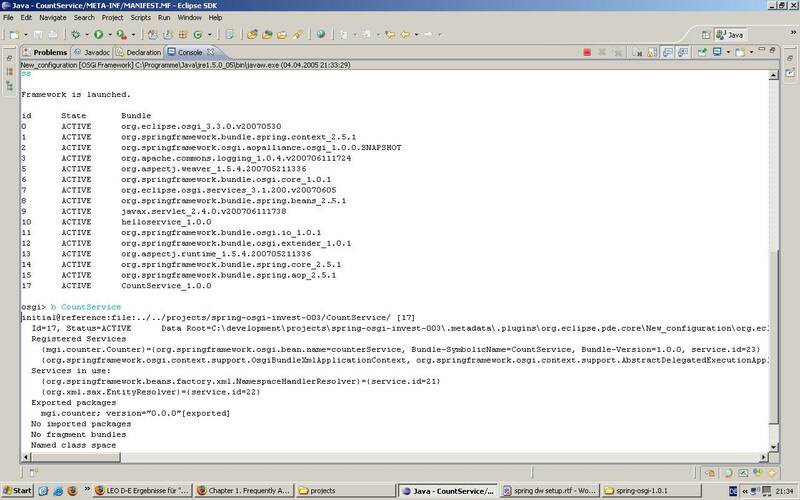 If you’re interested, you may take a deeper look about logging under OSGi here. With all the selected and necessary bundles, you now could start Equinox and see your bundle in Action (via Button ‘Run‘). As long as you’ve started Equinox with argument ‘-console‘ (see tab ‘Arguments‘ in your Start configuration), you can enter some commands via console e.g. in order to monitor the running OSGi container resp. the started bundles (see image below). That’s it – have fun building your own Spring-DM based bundles within Eclipse … ! Nice write-up. 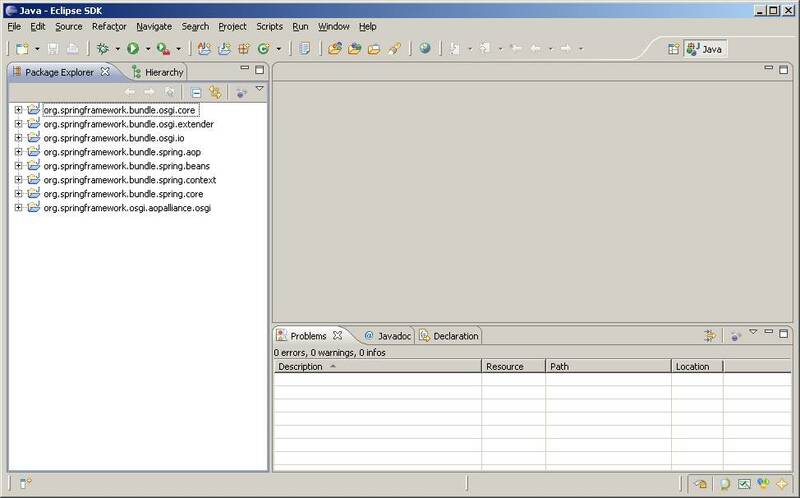 I’d like to add that in SpringIDE, there is a dedicated target platform that integrates into Equinox and includes all Spring-DM dependencies as well. Hello and many many thanks for this: Very interesting ! 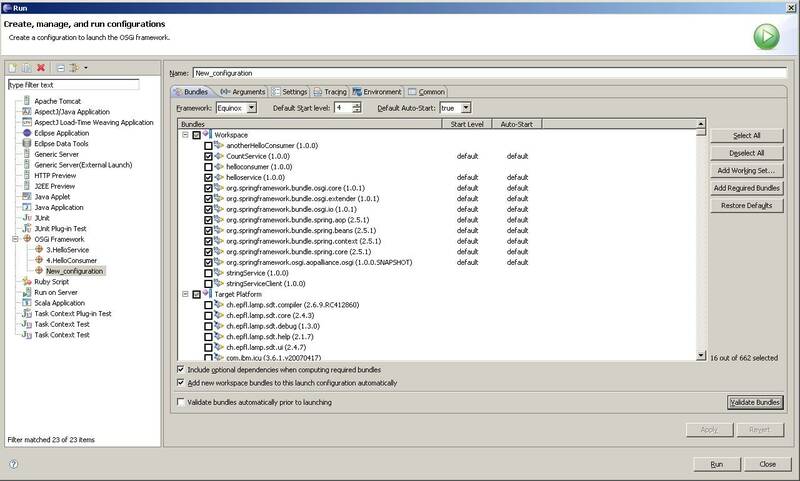 Once installed it integrates into OSGi Launch configuration by adding and extra tab that allows you to just select the checkbox for Spring DM. So basically to get Spring DM into the picture you just have to do one click :). The page on wiki is outdated so you will not find the Spring DM profile in the picture but is definitively there. This beside the fact that will allow you to start any open source osgi framework not only Equinox, so you can easily test if your bundles works on other frameworks. 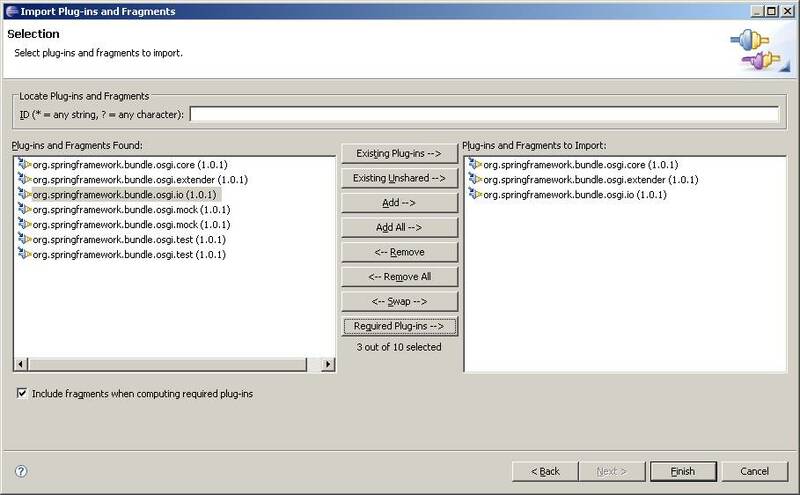 And for Equinox fans: you can start up any version of Equinox not only the version bundled with Eclipse. I’ll definitely take a look … ! Very nice explanation it helped a lot.